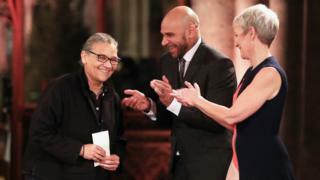 Lubaina Himid has become the oldest winner of the Turner Prize, and the first black woman to pick up the art award. The 63-year-old Zanzibar-born, Preston-based artist won the £25,000 prize for work addressing racial politics and the legacy of slavery. The judges praised her "uncompromising tackling of issues including colonial history and how racism persists today". She was named the winner at a ceremony in Hull, currently UK City of Culture. Described in February by the Daily Telegraph as "the under-appreciated hero of black British art", Himid made her name in the 1980s as one of the leaders of the British black arts movement - both painting and curating exhibitions of similarly overlooked artists. But she has now got the recognition she deserves. 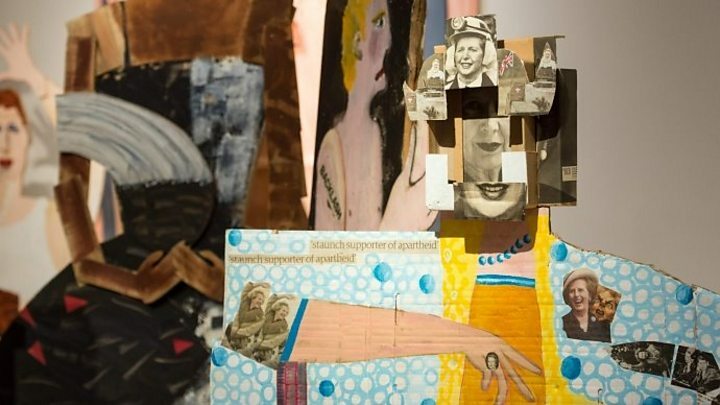 Her section of the Turner Prize exhibition in Hull contains work from the 1980s to today, including wooden figures, pottery and newspapers that she has painted on. The centrepiece is 1987's A Fashionable Marriage, based on William Hogarth's Marriage A-la Mode, which features a cast of cut-out characters including a flirting Margaret Thatcher and Ronald Reagan. There are also porcelain dinner sets, found in junk shops. Himid has painted images of black slaves on some and aristocrats - some of whom are vomiting at the news of the abolition of slavery - on others. She has also painted over parts of newspaper pages to show how they "used black people in a very subtle way which could be said to undermine their identity." She is professor of contemporary art at the University of Central Lancashire and was made an MBE in 2010 for services to black women's art. The Turner Prize panel said they admired Himid's "expansive and exuberant approach to painting which combines satire and a sense of theatre". They also said they "acknowledged her role as an influential curator and educator who continues to speak urgently to the moment". Has the Turner Prize gone mainstream? Himid said she was "thrilled" to win, and thanked a list of long-time supporters in her acceptance speech. She said: "To the art and cultural historians who cared enough to write essays about my work for decades - thank you, you gave me sustenance in the wilderness years." Lubaina Himid's Turner win is being put down to the well-documented rule change that did away with its 50-or-younger age restriction, which had been in place since 1991. Clearly, the 63-year-old artist wouldn't - couldn't - have won without the removal of the age cap. But there was another, less publicised rule change this year that also benefited her. For the first time the jurors were allowed to take into account the work each artist displayed in the Turner Prize exhibition. "What?" you may ask. "Hasn't that always been the case? Why wouldn't they take the exhibition the public see - and therefore judge by - into account?" Goodness knows why, but they didn't. Which might help explain some of the previous winners, and certainly makes sense of Himid receiving the contemporary art award for an exhibition packed with work she made some time ago. Her tableau A Fashionable Marriage, a satirical and political 1980s take on a scene from Hogarth's 18th Century series Marriage A-la Mode, was the single best work of art in the entire Turner Prize exhibition. It would have been a worthy winner when she made it in 1986 and - thanks to the rule change - it was a worthy winner last night. Speaking to BBC News afterwards, Himid said some of the art establishment was now catching up with her. "I was overlooked by critics, by press, but I was never overlooked by art historians or curators or other artists," she said. She said her win probably wouldn't change people's perspectives and attitudes, but added: "I think it will get people talking, which is the point of my work." Asked how she would spend the £25,000 cheque, she said: "I spend quite a lot of my money working with other artists, sometimes asking them to make things or helping them to make things when maybe they didn't get a grant or whatever. "So I'll do a bit of that. And I'll buy some shoes." After a change in the rules, this was the first time since 1991 that artists over the age of 50 were eligible for the prize, which used to be infamous for rewarding outrageous YBAs [Young British Artists]. As well as Himid, 52-year-old Birmingham painter Hurvin Anderson made it on to this year's shortlist. Tate Britain director Alex Farquharson, who chaired this year's jury, said there was a desire to celebrate artists who had previously been neglected by the mainstream. And there was a very international feel to the shortlist, which also included Stuttgart-born Andrea Buttner and film-maker Rosalind Nashashibi, who was born in Croydon to Palestinian-Irish parents. Their work is on show at the Ferens art gallery in Hull until 7 January. The Turner Prize 2017: Has it gone mainstream?